Edited by Eric Holt-Giménez, with contributions from Lucas Benitas, Olivier DeSchutter, Rosalina Guillén, Raj Patel, Josh Viertel and more. In communities around the world the power of the people is at work regaining control of our ailing food systems. According to the latest book from Food First, the global food movement is diverse, widespread, refreshingly creative and tremendously powerful. Food Movements Unite! Strategies to Transform Our Food Systems brings us the words, insights and vision of the remarkable farmers, workers and consumers from rural and urban communities around the globe as they address the critical question: How can we unite to transform the global food system? The 21 activists and practitioners contributing to this work write “from the trenches” of the food, fuel and environmental crises have much to say about our food future and the potential of this unprecedented “movement of movements.” From the writings of Raj Patel, author of Stuffed and Starved and Olivier De Schutter, UN Special Rapporteur on the Right to Food, to João Pedro Stédile of the Brazilian Landless Worker’s Movement (MST), this insightful book is a window into the thinking and actions of the people committed to bringing us affordable, healthy food in ways that harm neither the planet nor its people. I think that we need to create alliances between all the food movements. We all want a healthy food supply and everyone in the chain to be treated with dignity—from the production worker to the consumer. But we are facing a monster: the corporate world. They are only interested in money and profits. We have to be clear, relentless, and determined to do what it takes in our communities to create change where we want it. Eventually these corporations, if we hit them where it hurts—if we go for their profits—will be forced to change the way they do business. Maybe we can’t make Walmart disappear, but we can change the way they do business. The power is in our hands. The first thing we must to do is develop consciousness and commitment to create change. Download the Presbyterian Hunger Program’s companion bible study guide. 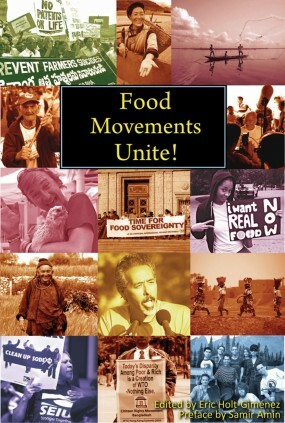 Food Movements Unite! is also available in Italian through Slow Food Editore.